Leptopteryx cruenta Wagler, 1827, Java. Four subspecies, one each in four regions of accurrence. English: Black-and-crimson oriole; French: Loriot ensanglanté; German: Rotbrustpirol; Spanish: Oropéndola de Pecho Rojo. 8.5-9 in (21.5-23 cm); no weights available. 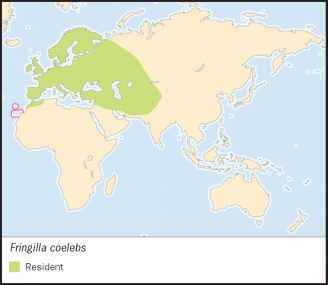 A dusky, gray-billed oriole with crimson or chestnut lower breast and belly and mark in wing. 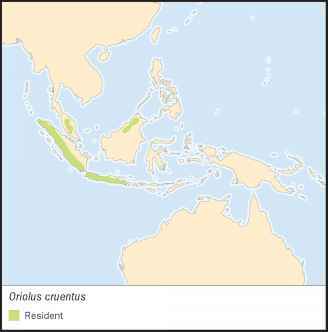 Greater Sunda Land: Malay Peninsula, Sumatra, Java, and north Borneo. Closed, primarily high montane rainforests above 3,300 ft (1,000 m). Retiring and sedentary, working locally through the inner forest canopy and forest midstage singly or in pairs, although foraging out into cloud forest at high altitudes. Song is a short, mewing, nasal warble of about four syllables, repeated at intervals. Little known, though hops about actively when foraging and often descends to logs in forest substage. Eats small soft fruits such as figs and berries, and takes a wide range of insects including termites, diverse larvae, and particularly caterpillars, both hairless and haired. None of the four mountain island populations appear to be under threat at present, although accelerating habitat destruction could impact them in the future.